The Orange County Restaurant Association has finalized participation of more than 100 restaurants that will unite for the region’s fastest growing and most anticipated culinary event. Click here for the complete list. The week will begin with an official kick-off party at Prego Ristorante in Irvine from 4 p.m. – 6 p.m. on Sunday, September 26. There is no cost to attend this event (parking in lot will be validated), but space is limited and those interested in attending must RSVP to JILL-FM, who will be broadcasting live from the event, online. Guests will have the opportunity to taste the many flavors of Prego as the restaurant, which is also celebrating its 25th anniversary, showcases its cuisine with tray-passed fare. In addition, Tres Agaves tequila, Sobieski Vodka and 4 Orange Premium Vodka will be sampling signature cocktails for all attendees. A complimentary wine-tasting by Coppola Winery will allow guests to experience some of the finest Prego has to offer. 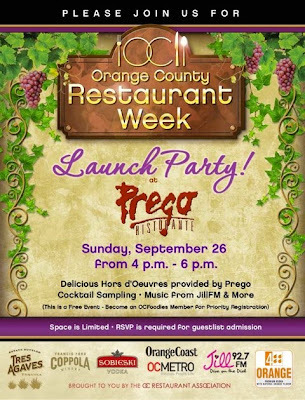 Prego will be offering its weekly Happy Hour during the course of the event and guests are invited to stay for dinner and enjoy Prego Ristorante’s $30 OC Restaurant Week prix-fixe menu, which includes a glass of house wine. Click here for more information and to see the menu. This will be a great time to get in touch with your inner foodie. We are looking forward to hearing what restaurants you visit. What was good, what wasn’t. We will be sure to share our foodie adventures as well.